Microneedle Your Own Face at Home? One word....DON'T. Microneedling at home with one of these 'rollers' is absolutely not recommended in the industry no matter how careful you are or how much you spend on a device. You have no control with depth of penetration and proper sterilization techniques. The aftercare needs to be followed to avoid infection and /or hyperpigmentation. 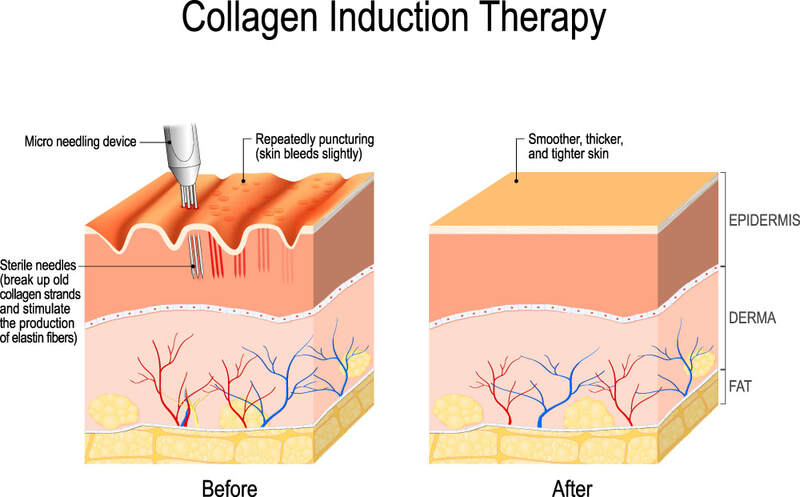 Please only have a licensed professional such as a permanent cosmetic technician (PMU), tattoo artist, nurse or dermatologist with special training and proper certification perform this advanced treatment also called collagen induction therapy or skin needling for you. Simple stated, stay with a small molecule size for best penetration. Microderms, commonly known as Microdermabrasion can often help to slough off old dead skin we need to shed and ultimately provide a better canvas for those high performing ingredients to penetrate like peptides and serums. If the ingredients in your product are small and permeable, they will be uptaken by skin cells and processed. After a period of time, the ingredients will be secreted out of the skin cells and will enter the circulation. This includes ingredients like L-ascorbic acid (vitamin C), tocopherol acetate (vitamin E), and retinol (vitamin A). If the ingredients in your product are not absorbed by your skin cells, they may also be temporarily absorbed by some glands in a process known as ”appendageal absorption”. In this process, there are “reservoir effects” in which substances may be stored within the glands for absorption over time before being released into the bloodstream. This includes ingredients like aluminum, which is the reason for some of the controversy surrounding aluminum-containing deodorants. Microdermabrasion is a very effective skin treatment that can help to renew your skin and give it a more youthful appearance, if you opt for multiple treatment sessions then the benefits for your skin can be incredible. Microdermabrasion is a form of deep exfoliation utilizing vacuum suction and a diamond tip head (don't worry it is not painful, think of how a cat's tongue feels) It assists in removing dead skin cells and improve the texture and smoothness of the skin, as well as promoting the production of fresh collagen and cells. As well as simply creating a youthful glow, it can be used to treat a wide range of skin problems including fine lines, sun damage, flaking skin, enlarged pores, acne scars, pigmentation, dry skin, age spots, stretch marks and more. Microderm assists in helping products to be better absorbed such as serums and moisturizers. No Preparation Needed – Because it can be used directly on skin without any preparation, it is a very convenient treatment which you can enjoy whenever it suits your schedule. Instant Results – As soon as you walk out of the clinic you will already be able to notice the difference in your skin. It is fast acting and you will not have to wait days before you see the difference. Comfortable and Painless – Some skin treatments may lead to mild discomfort, but a microdermabrasion facial is completely painless so it is suitable for everyone. Suitable for All Skin Types – One of the great things about microdermabrasion is that it can be used on any skin type so you know that it is suitable for you. Improves Absorption of High-Tech Skincare Products – If you use high-tech products to make your skin look and feel better, a microdermabrasion facial allows these to be absorbed into the skin better so that you get more out of them. Clean Pores – You will not have to worry any more about clogged pores because ongoing microdermabrasion treatment will clean out pores to leave your skin smoother and healthier. New Skin Cells – When a microdermabrasion facial becomes a regular treatment, your skin cells will be replaced with new, healthy ones which will make your skin look and feel better. Smoother Skin – You will be able to enjoy much smoother skin which is free from blemishes and fine lines when you take advantage of multiple treatments. Reduced Scarring – If you suffer from acne scarring then a regular microdermabrasion facial treatment can significantly help to reduce the appearance of scarring. I love using enzymes in my enzyme facials, fruit enzymes such as pomegranate are great for oily or acne prone skin. Lemon enzymes are wonderful for hyper-pigmentation/sun damaged skin and one of my personal favorites is Papaya-Coconut. Enzymes utilized in skin care primarily include those that digest protein in skin, such as keratin, which is present in high concentrations in the upper layer of the epidermis. Papain from papaya and bromelain from pineapple are two of the most common enzymes. Enzymes are generally very safe, because they have a limited reactivity with skin due to the fact that they can only digest the keratin protein they come into direct contact with. The key to success with enzyme systems is keeping the enzyme active before it is applied to the skin. For instance, a single-enzyme product that contains water and enzyme has a very short shelf life, because the enzyme can digest itself. Also, it should be noted that many enzyme products are formulated together with acids, which can make the exfoliation more aggressive. These treatments should be categorized as chemical acid peels rather than an enzyme. Very often, these additives are not disclosed; therefore, skin care professionals should be sure to test different enzyme products and choose the appropriate strength for a specific client. I personally love peptides; I have seen quite an improvement in my own skin since I have been using them. The benefits of peptides can be increased when using them in conjunction with collagen rejuvenation therapy, commonly called skin needling or micro needling. When you are shopping for the best products to help reduce the signs of aging, it is important to give careful consideration to products that utilize the peptide for skin care approach. This ingredient is a broad term to describe chains of amino acids, which serve as the building blocks of cells and tissues in your body. Using peptide for skin care is considered a viable strategy by some dermatologists because skin care products containing these ingredients are meant to stimulate the cell rejuvenation process and even stimulate collagen production. Therefore, products with these chains of amino acids are generally considered to be anti aging in nature. It is important to note that the use of peptide for skin care products will not yield results overnight, but daily application may show improvements over time. Peptide for skin care products use chemicals that are close relatives of proteins, which are the building blocks of our bodies on the cellular level. These nutrients are kept together with nitrogen and carbon molecules that can work their way into the epidermis and “speak” to the cells. When products using peptide for skin care make their way into the skin, it may stimulate collagen production to tighten skin, and may even repair some cell structures. This is important because collagen is what keeps the skin plump and full, and helps it withstand the natural appearance of wrinkles that is so common with aging skin. Unfortunately, as we age, collagen production begins to decrease and the skin becomes more likely to sag. Add to that years of unprotected exposure to the sun, and the skin doesn’t just lose collagen faster, but starts to appear dry and sallow, exacerbating the appearance of wrinkles. Using a peptide for skin care strategy may help reverse this process, allowing you to retain beautiful skin longer. When you choose to use a peptide for skin care product routine, you have to be diligent about applying the ingredients regularly. Most people do not see results from their peptide products for at least one month or more, and in some cases, the results do not show for up to 3 months! Unfortunately, many people also do not have the patience to wait that long for results, and stop using the cream after just a few weeks. Some people don’t notice results because they are too gradual, while some may not see any improvement from a peptide for skin strategy at all. You specific situation and skin type will play a large role in determining the final outcome. There are several different types of chemical used in the peptide for skin care product lines. Most commonly, two types of peptides in cosmetics are Palmitoyl Oligopeptide and Palmitoyl Tetrapeptide-7. The former needs to be used for at least four weeks or more to see any results, and works mainly by helping to keep connective tissues structured. Products with this type of peptide will help keep the skin from sagging and may also reduce the signs of wrinkles. The latter, Palmitoyl Tetrapeptide-7, is a popular ingredient which aims to reduce inflammation in the skin. This peptide for skin care also helps the skin fight against problems that occur from free radicals that damage the skin even more. Two lesser known ingredients used in peptide for skin care products are Palmitoyl Pentapeptide-3, which stimulates collagen, and Acetyl Hexapeptide-3 which behaves in a similar way to Botox. The latter peptide keeps muscles relaxed, so wrinkles are less likely to appear. Peptides not only help stimulate collagen growth, but they also deliver copper into the skin, which can help the skin heal faster. Since microscopic ingredients in peptide for skin care strategies can penetrate deep into the skin layers, these amino acid chains help heal the skin faster than many other types of product. For example, a copper peptide serum may help heal the skin while working to increase collagen as well. Peptide for skin care products are usually available in serum and cream form. However, it is important to keep in mind that different product types work differently, even if they have similar ingredients. For example, the creams will moisturize the skin, but may be too heavy to allow helpful ingredients to penetrate the skin, thus diminishing effectiveness. Serums, on the other hand, will allow the peptides for skin to be absorbed more quickly, yielding more meaningful results. I really can not stress enough the importance of a good moisturizer year round. Matrix oil can be added to your moisturizer for an added boost of hydration. Hint: Men love Hyaluronic serum, it is easy to use, dries quickly and does not have fragrance. Autumn is in full swing with days growing shorter and air getting drier. Foliage is at its peak, and colors abound in the trees. As the summer months flee, so does many's conscious effort to make sure they’re protecting their skin from UV rays. Let’s be blunt here, just because the days aren’t lasting as long doesn’t mean the sun isn’t permeating UV rays. On the contrary, this is a year-long occurrence. So, let’s focus on ways to treat your skin as Autumn presses on. As we start to heat our homes due to the cooler temperatures and overall decrease in naturally occurring humidity levels, its important to get SOME moisture back into the air. Humidifying is essential in keeping your skin properly hydrated. Due to the lack humidity in the air, your skin can dry out and crack, and also see increased flareups of eczema, rosacea and hypersen­sitivity. Whether you’re using a scrub, a dry brush or something like fruit peels, treat your skin to the remedying effects of exfoliating dead skin cells. By not treating the cells that naturally die off due to seasonal change and other factors, you’re inadvertently clogging pores that can lead to worsening skin conditions. Exfoliating is important because you’re freeing those pores and opening up the pathway to better hydration and thus, a means to experience better miniatur­ization with the use of oils, creams or just plain old water. "Just because the days aren’t lasting as long doesn’t mean the sun isn’t permeating UV rays." The last two entries have harped on the idea that it’s important to moisturize your skin as cooler temperatures set in. One of the most obvious things you can do is purchase and utilize the benefits of high-quality skin creams. These leave your skin feeling smooth, better moisturized and enable the skin to be more elastic. Further, choose creams that have UV protectant, or SPF, in them to keep your skin completely healthy and safe as you would in the summertime. The sun’s UV rays don’t pay any attention to the temperature of the air. Don’t forget your lips! So many people do. The colder temps will dry them out as they do other parts of your body, and your lips are exposed to cold winds that other parts of your face might not be, depending on what you’re wearing. Use a good quality lip balm that includes SPF and cover all the bases. In summary, there are always going to be unique ways to bolster skin health as the seasons change. Those solutions will vary depending on geographic location. What we’re always stressing here at IMPACT Melanoma is the utilization of SPF in whatever remedy you’re considering. It doesn’t matter what products your pampering yourself with if SPF isn’t a part of the equation. UV radiation is serious, and those rays are cutting in and compromising your health every day and not just summer days. Whether it’s a day accented by a cool autumn breeze, a mountain retreat to hit the slopes in the midst of a snowstorm or a mid-summer heatwave, UV is UV regardless of the digits on the thermometer or the colors of the leaves in the trees.